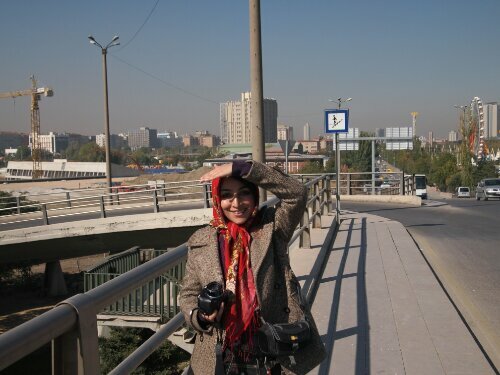 In Ankara I had originally planned on getting my Iranian visa. By the time I had arrived though I was pretty sure that I wouldn’t be going via the middle east. Instead I planned on sorting out other visas I might need, getting cold weather clothes and getting my bike checked over. In the end I only did one of these…my bike is now I hope in better condition! The service was almost overdue as I had nearly worn the brake pads down the metal. I didn’t bother getting the visas for Azerbaijan, Kazakhstan or Uzbekistan in Ankara as I figured I could get them as easily in Georgia. As for cold weather kit: it had warmed up a fair bit and I didn’t fancy lugging around anything extra I might not need for a few weeks. In Ankara I didn’t do much sight seeing. This is mainly because there are not many sights in Ankara to see and I had seen most of them when I was there on holiday a few years ago. I did get shown round the city by someone who hosted me for couchsurfing for a couple of nights which was better than wandering around on my own! I also spent a couple of nights in a hostel there and went around the Turkish equivalent of the Tate Britain with an Iranian artist staying in the same room as me. 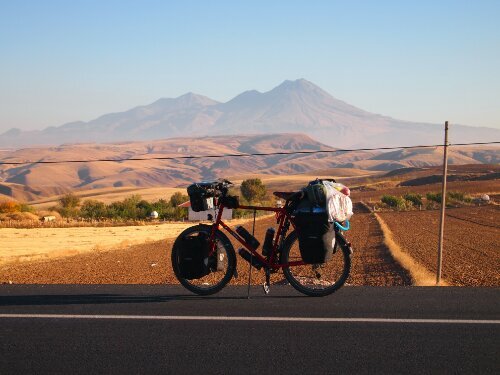 Four nights in Ankara had left me pretty restless and I was glad when leaving time arrived, especially as it was now warm enough again for me to ride in shorts and cycle jersey only. It was not long after I had ridden out of the city that I realised in my eagerness to set off I’d forgotten my bike lock. I thought this was going to be a real pain as I did not know when I would next be in a city with a proper bike shop. When I got to Golbasi (the next town from Ankara) I decided to ask around. After a few enquiries I eventually ended up at what I guess was a cycle mechanics as it had bikes in various states of repair outside. When I asked for a lock the guy there brought back something that looked like a determined thief could chew through it. As it was less than GBP 2 I bought it anyway in case I couldn’t find anything better. Then I remembered the chain that was hanging outside one of the shops I had asked directions at. So riding back I bought my first length of chain in order to use it as a lock with a padlock. The chain looked like it might damage the bike on its own so I got the man in the shop to cut me some hose to put round it. Annoyingly the chain kept slipping through the hose so next we tightened a couple of hoselocks at either end to prevent this. I now had a pretty heavy duty looking bike lock that cost 5 Turkish Lira or less than GBP2. Of course all you needed to get through it was a pair of chain cutters but that had been the case with the old lock too. 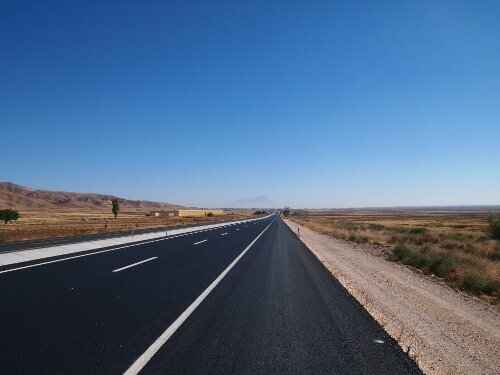 I then rode on across more seemingly never ending Turkish roads, happy I had realised I could read my kindle while riding. 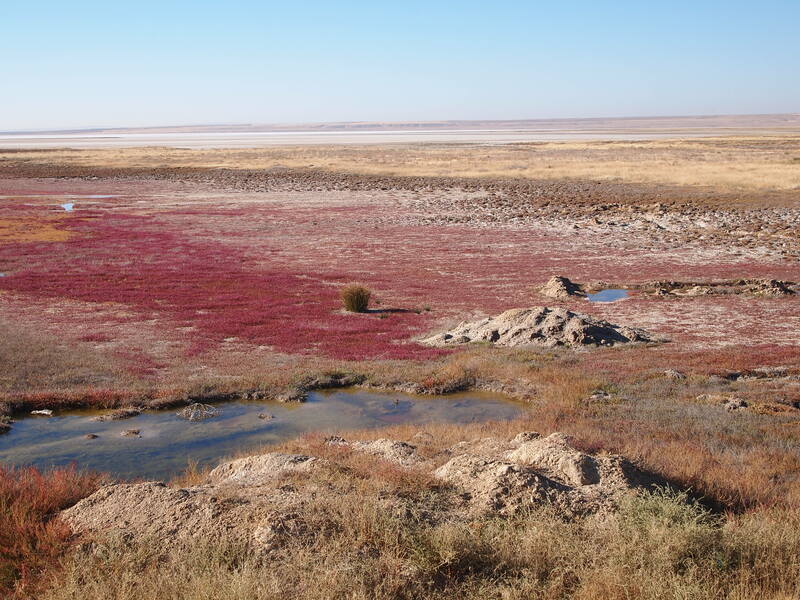 My day ended at the very tip of a giant salt lake called Tuz Golu, where I laid up at a friendly petrol station. The next day I rode off round the very flat road around the Lake. 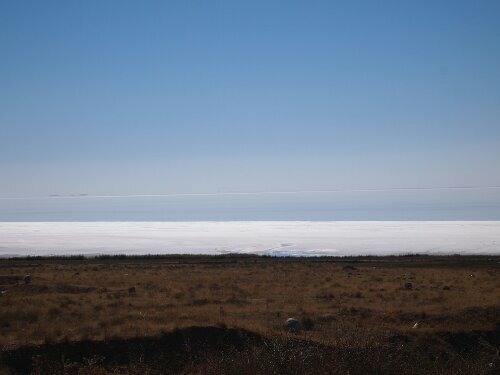 As it was the dry season I think the lake was dried out and I was thus able to see the salt flat. At some points it was just whiteness stretching off into the horizon looking like it went on forever. On the way round a melonseller pulled me over for tea and he kindly gave me a melon as I was leaving. Sadly this melon must have weighed over a kilo, for the weight conscious cycle tourist a 1kg melon is the last thing you want to be carrying around, especially when you a) don’t have a knife big enough to cut it and b) hate melon. With a slight feeling of guilt I passed it onto the next people I saw. Riding on I made it round the lake and past Aksaray to a petrol station near Gencosman, where I decided to camp as it was getting dark and I wasn’t sure there would be another petrol station for a while. 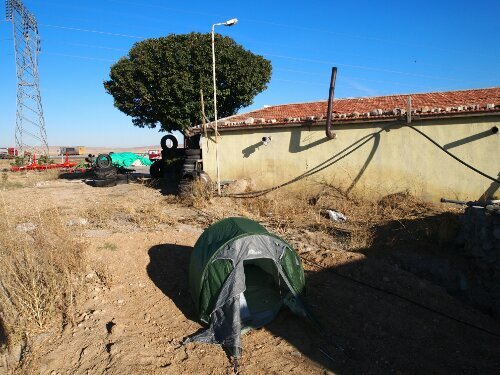 I was starting to realise that some petrol stations were better to camp at that others, the first one I camped at had a nice patch of grass and a shower in the toilet block. 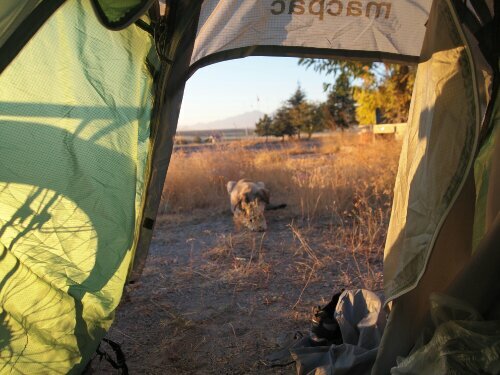 The one at Gencosman barely had a toilet block, still it was free and there was a dog to keep me company/awake with its barking. The next day I rode for Cappodacia and the town of Goreme.